To compare pictures or photos in several folders, you have different options Drag & Drop to the selection box, or folder selection button! You can also use Drag and Drop from MS-Explorer, to add Files or Folders for image search job. In Find.Same.Images is also an internal Explorer View , you can use also this to change or ad folder about Drag and Drop. Please always use ... the new Find.Same.Images.OK! (Image-1) Compare Images in Multiple Folders! To compare and find similar pictures or photos in several folders is suitable for example for: Windows 10 (Redstone 4 & 5) Pro, Enterprise, Home, Windows 8.1, Windows 8, Windows-Server 2016, 2012, 2008, Windows 7 Basic, Professional, Starter, Ultimate and easy to use to fin same or similar images on yo Computer, extern and intern hard drive (SSD, SD Cards, USB-Sticks). 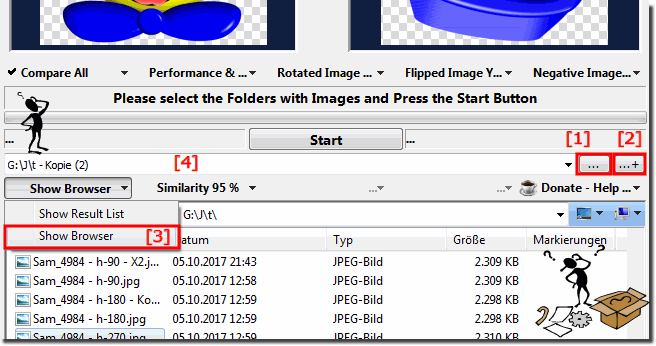 Find.Same.Images.OK - FAQ-7: How to compare Images in Multiple Folders?